In the Beginning Fabrics has produced a new line of fabric that fits into the "collectors" category. I personally collect a few fabric categories: typography (words and numbers), solids, Kokka, certain designers, etc. I am going out on a limb and guessing you do some collecting, too! It all becomes part of the gallery that is my retirement plan! The fabric I am talking about today is Deco States. 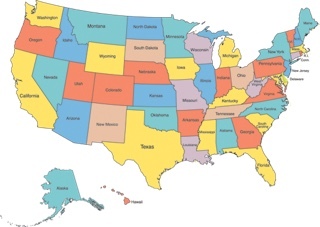 It includes the state flower of each of our 50 states. They are designed in an art deco style, and the flower graphics are tiled in rows across the fabric. We didn't purchase all 50 bolts of this, due to space restrictions. But we do have some good choices if you have an interest in owning all of the state flowers. 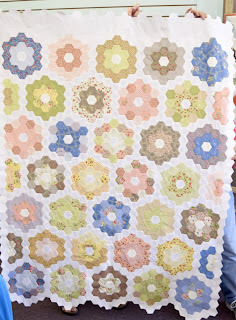 In The Beginning has packaged up 10" square bundles and rolls of 5" x 40" strips, so you will get each different flower. The pack of squares contains all 50 flowers. 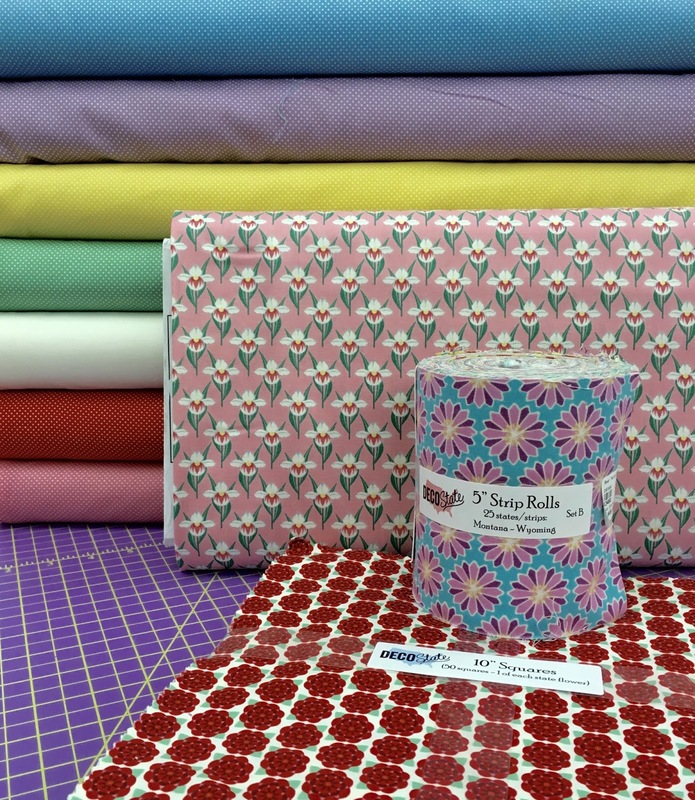 The rolls of 5" strips contain 25 flowers, so you would have to purchase Set A (Alabama-Missouri) and Set B (Montana- Wyoming) to have the entire collection. In addition, there are 7 pin dot fabrics that are coordinated to complement the colors used in the floral prints. We have bolts of those dots on hand, as well as our own flower, the Lady's Slipper. just call us (651-429-1039) and we will set you up! 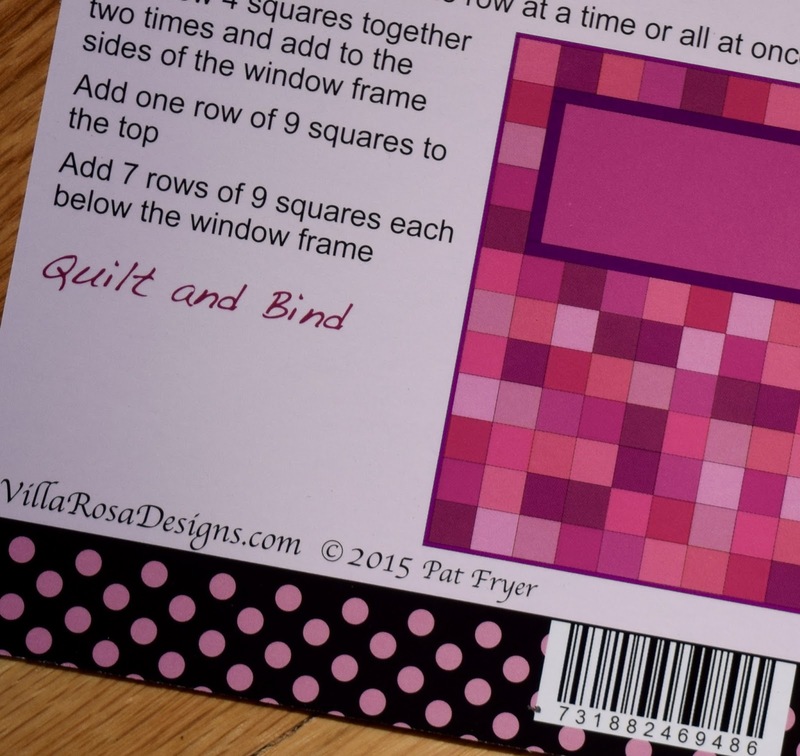 Are you looking for a special treat for your group of quilting friends? 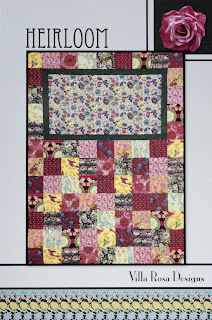 There is a current quilt exhibition still showing until October 23 at our very own American Swedish Institute. Just visiting the Institute itself is a fun and unique excursion. But with the bonus of the quilt exhibition, you really should be planning a visit soon! Quilting Art Today and The Nordic Quilts at the American Swedish Institute is a combination of works of local and internationally known quilters. It covers everything from traditional designs on through contemporary art quilts, and there are a few clothing pieces included, too. 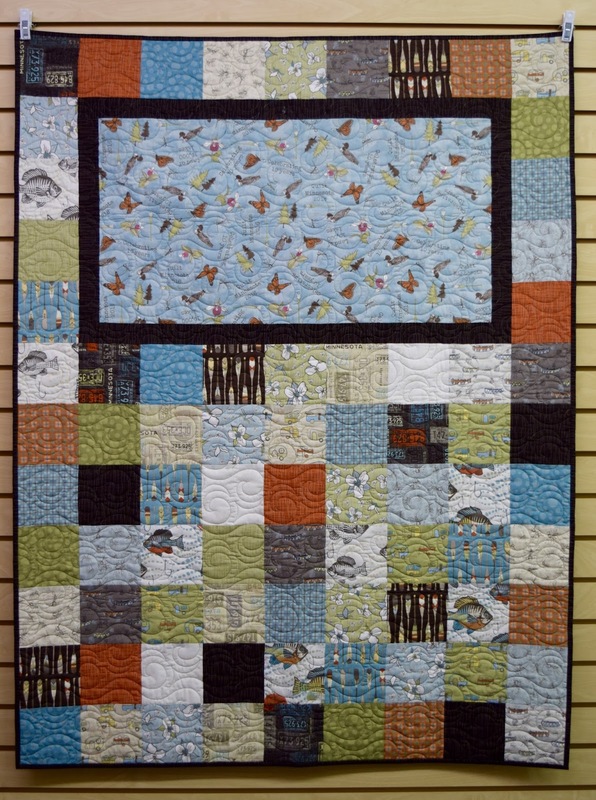 There are designs that are uniquely individual in some cases, as well as wonderfully crafted designs that are not uncommon in the quilting world. You might not fall in love with all of them, but I'm sure there is something that will appeal to you and trigger a creative idea in your brain! To make the most of your visit, you might want to try to go on a Tuesday or Thursday to get the benefit of a guided tour of the quilts. You can use this link to get the times and details. The Minnesota Quilters plays a big role in bringing this exhibit to us. There are "live quilters" on hand at some designated times on Wednesday evenings and weekends, details in this link. 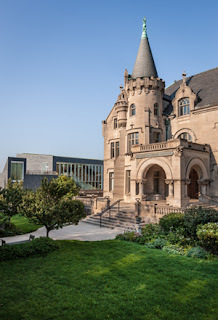 I have visited the American Swedish Institute (ASI) numerous times over the years, but hadn't been back since the addition of a beautiful new wing. Now the beautiful old mansion is made even better with this new section in the modern Scandinavian style. The Swedish gift shop and Fika, the tiny little coffee shop in the mansion, have been moved to the new addition and are open and bright. They serve really tasty coffee and cookies! I visited about 3 weeks ago with my daughter, who is the person that started my trips to ASI when she was pretty young. She went to classes and activities for children, and she loved it! I guess having ancestors with the names of Hansen, Hanson and Larson, plus my own history of living in Sweden, plus blonde hair and blue eyes all worked in her favor! She went on to go to Concordia College Swedish Language Camps, took Swedish classes at Gustavus Adolphus College, and returned to ASI as an adult to take more language classes and then took her first baby son there to ride the Dala horse! Getting to ASI isn't hard, it's not far from the major interstates. It's on the corner of 26th Street and Park Avenue, and a parking lot was added with the new addition, so that makes it much easier for visitors. There is a small admission fee ($10) and you can find all the important visitor details at this link. So, if you can take a few ideas to soak up some quilting and Swedish culture, you better plan your visit soon before the quilts go away! Putting the Pizzazz in the Paper! 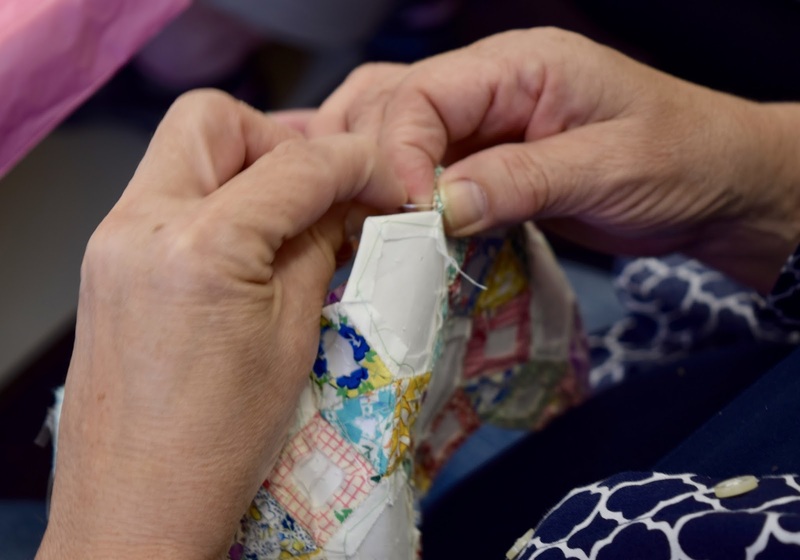 The art of hand sewing is not fading away for this group of women! 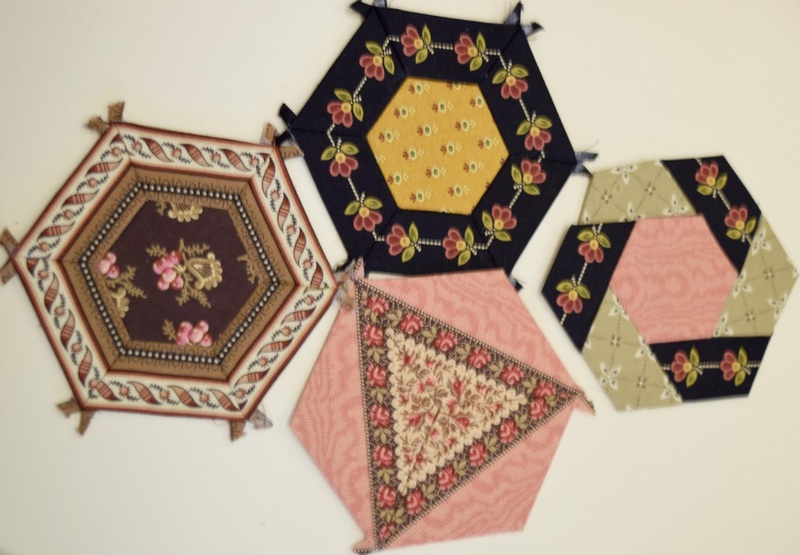 Each month, on the 2nd Tuesday, you will find them sitting down with needle and thread and an English paper piecing project. 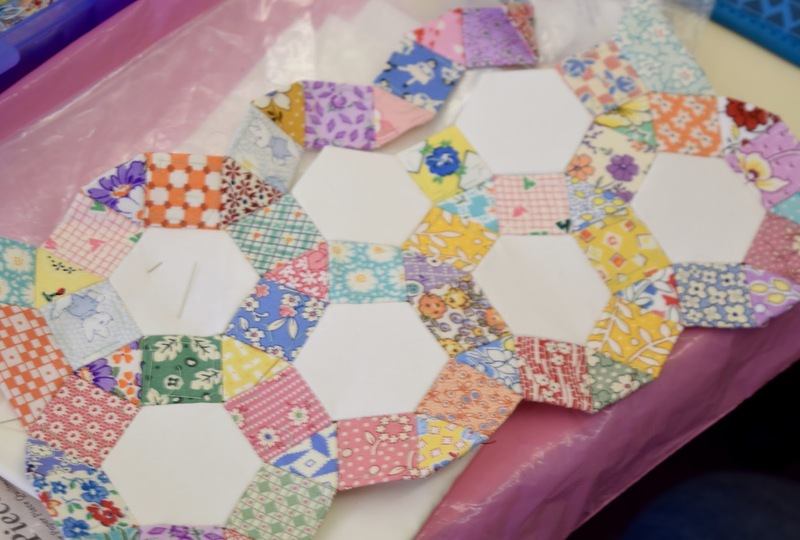 Our Paper Pizzazz group has such talent and varied skills. Some have known how to do the stitching for English paper piecing for a long time, some are newcomers to this. Some like traditional, some like a little more whimsy and bright colors. Some stitch fast, some stitch slowly, and there's no expiration date for how long a project can be "in the works"! We enjoy the inspiration gained from each other, resurrecting old ideas and creating new ones. Stitching by hand is such a fundamental form of the craft of quilting. It's a very tactile aspect of what we do, very "in touch with" the fabric, thread, needle and the paper shapes. We are always learning a little something new, whether it's how to combine shapes differently, how to baste the quickest and neatest way, what needles feel the best in our hand, what threads pull through the fabric smoothly, and how to keep it all organized! 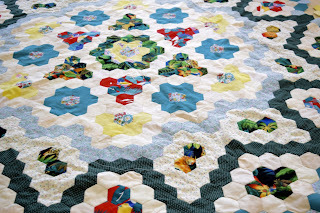 Lynette's hexagon medallion that keeps growing! Deb's carefully planned and partially stitched hexies. 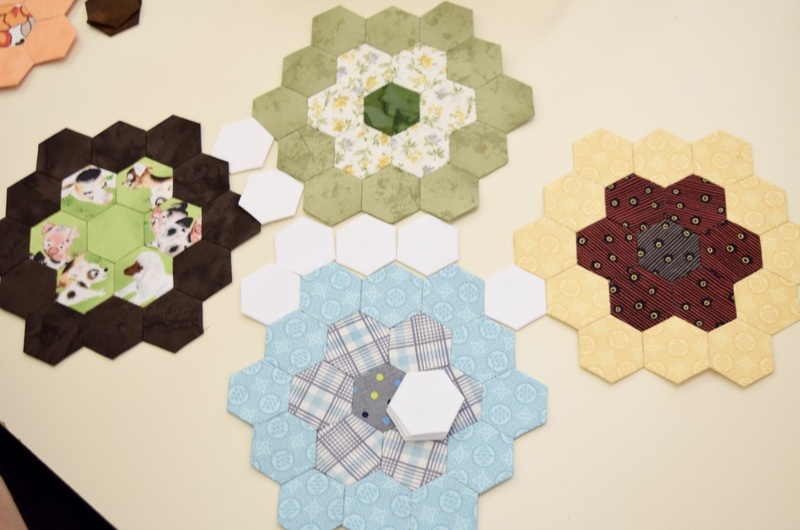 Pam's collection of hexagon "flowers" made from the remains of other quilts. and discussion on finishing techniques. Mary's "wheels" made of reproduction 1930's fabrics. Our group is casual and open to anyone interested, no matter your skill level. 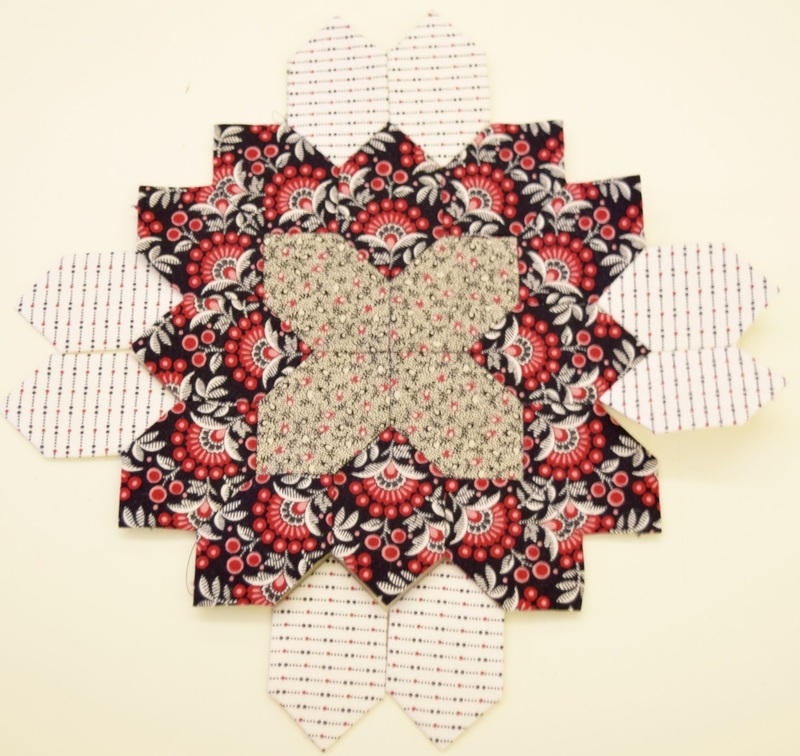 When Lynette started her medallion project shown above, she was a rookie at this. But she was game to learn something new, and committed to using fabrics she already had on hand. And look how far she's come! That could be you! So next time we get together, October 11 at 1 pm, maybe you can be there to pull up a chair and join us! Last week we sampled a new recipe I had for a dip that is near and dear to my heart. It's made with Cookie Butter, and if you haven't yet tasted Cookie Butter, just get yourself over to Trader Joe's and pick up a jar! I am not kidding when I say that my day starts out best when I have Cookie Butter on my toast! We sampled this dip on apples, pretzels and Bugles. The Bugles make a good little scooper for the dip and still pop in the mouth in one bite! Here's the recipe, which I found on this blog. Whip it all up with a mixer so it gets some fluffiness. And eat! How simple is that!? The seasons are changing and so are we! New classes for the fall means new samples up all over the store! Everything is listed on the website class listing. I think we have all the dates right, but now and then we miss something even with several pairs of eyes proofreading! If you have any questions at all about the classes or the process to register, please call us! Saturday, September 10, is our in-store registration day. If you can make it, stop in to see us and the quilts! If you aren't at the store, you can call to register or use the online registration (in the drop-down menu under classes). Now, enjoy a show of our newest projects! 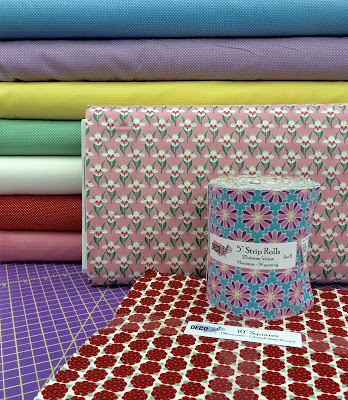 Today we are sharing an idea that we use when we have some great fabric in a collection, and we want a way to show it off to our customers. We try to find ways that are quick and simple to display for you. Sometime you might just sense that a fabric is calling your name, but you don't have any notion about what you would do with it. We can help you with that! 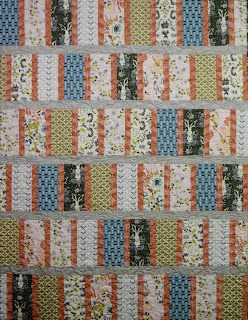 This little lap quilt was made using 6 fat quarters plus a fabric for the vertical spacer strips and another for the horizontal sashing strips. Pretty easy picking even when working with a small group of coordinates. 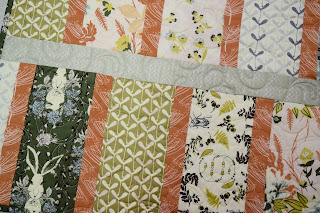 The fabrics for all the blocks were Forest Floor from Art Gallery Fabrics. They are sorta sweet, sorta funky - especially that bunny who looks like he came from Alice in Wonderland! The horizontal sashing strips are a great basic print from Cotton and Steel, and it has a little glimmer or "pearlescence". Villa Rosa Designs prints a multitude of uncomplicated patterns that can be soooo convenient to use! They are printed on a glossy "postcard", finished picture on one side and directions on the reverse side. They make great collector's items! And they don't break the bank! You can purchase 4 or 5 of these for the price of one standard quilt pattern. Here's a portion of the back of the card, showing a diagram and some printed instructions. The directions are brief and to the point. There isn't room on the back of a 4x6 card for many details! 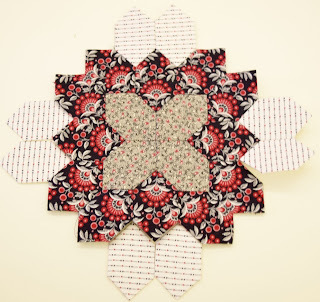 Many, maybe most, of the patterns make use of standard pre-cut fabric sizes (5" squares, 2 1/2" strips, 10" squares, etc.). Or you can cut yardage to the recommended sizes. 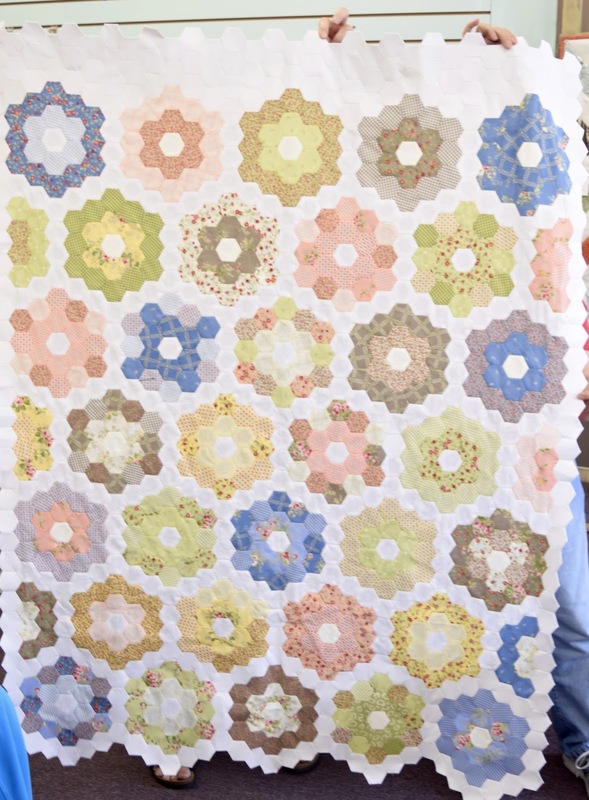 This Heirloom pattern is a great pick to feature a focus print in the large rectangle. Those fabrics that you love, but have a hard time cutting into because then the design will be chopped up? I think you know what I mean, and you probably have a few! 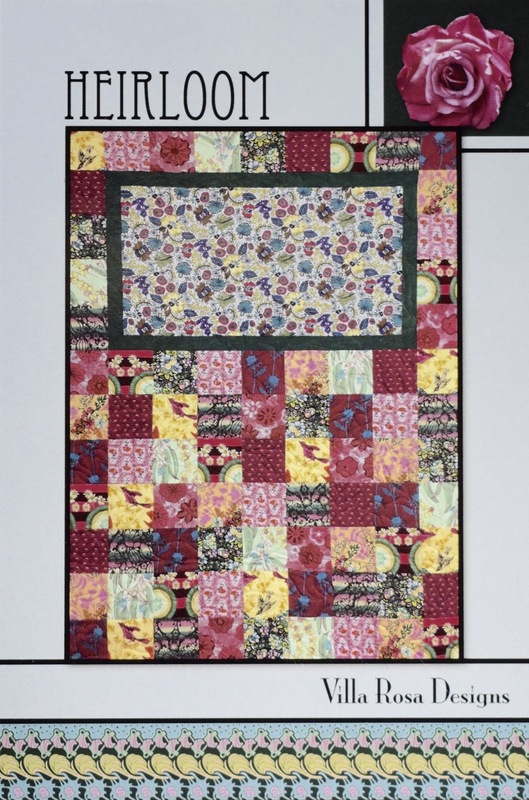 Well, now you can actually put that gorgeous or unique or whimsical print into an actual quilt and it can be of some good to someone, not just occupying space in your fabric collection. So go ahead, indulge yourself in something fresh and new! Won't be long before you have it all stitched up and warming someone you love!